Although the men’s Chinese basketball team lost all 5 of their Olympic games by 25.2 points per game, the AP published a pretty good piece on how they have started to practice more like Western teams, thanks to American coach Bob Donewald. In three years at the helm, Donewald and Philo managed to change some aspects of China’s rigid basketball program. Donewald negotiated the power to choose the team, a huge departure for a CBA that has dictated the roster, coaching staff and even bed times for players. The players no longer wear themselves out with eight hours a day of practice and the focus has shifted to defense. Whenever a player did not talk on defense, his name was put on a board with a check mark by it. The more checks, the more sprints he had to run after practice. In a developmental system where every decision is made for them, they have tried to instill some sense of individualism, some “swagger,” as Philo likes to put it. Today in London Chinese 110 meter hurdler Liu Xiang had another heartbreaking moment, tripping over the first hurdle in his heat, falling to the ground, and not finishing the race. After winning the gold in the 2004 Athens Olympic games in the same event, Liu is officially out of the Olympics for the second time in a row after having to bow out in Beijing in 2008 because of an Achilles injury. After Liu fell, he immediately started rubbing the same Achilles that gave him problems in Beijing. After getting up, he hopped around on one foot to the tunnel away from view of the fans, but came back out and hopped the distance of the 110 meter track to kiss the last hurdle, and say goodbye to his competitors. 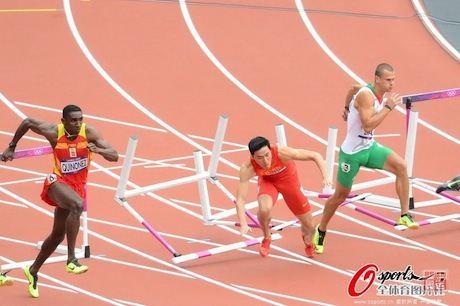 Click here for more compelling photos in the forum of Liu Xiang after falling, thanks to Raymond. As you may already know, Yao went to London to be a CCTV5 television commentator for Chinese basketball games. Unfortunately, the Chinese team lost all 5 of their games at the Olympics by an average of 25.2 points. 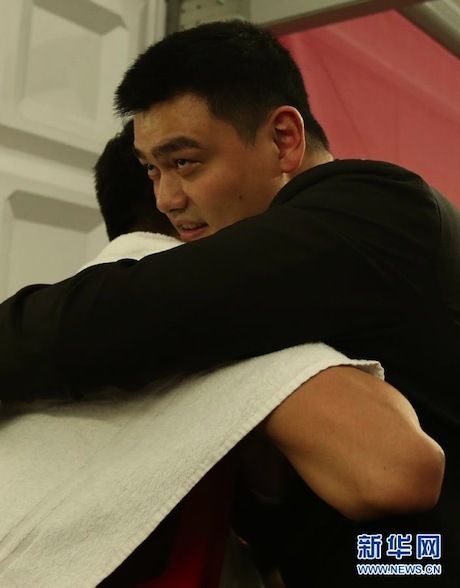 After their last defeat against Great Britain that knocked the Chinese out of the Games, Yao rushed down to interview and console Chinese player Wang ZhiZhi, who probably played in his last Olympic games. 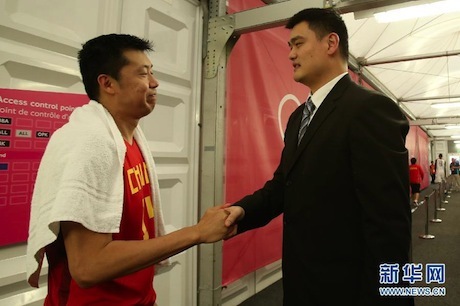 Click here to see more photos of Yao and Wang ZhiZhi, courtesy of Raymond in the forum. Meanwhile, Yao was recently asked about some of the controversies that had fallen upon some Chinese athletes in other Olympic sports. Regarding the amazing performance by Chinese woman swimmer Ye Shiwen, whose time in the final 50 meters of her 400m medley was quicker than U.S. winner Ryan Lochte and Michael Phelps in the men’s competition, Yao responded to accusations from people like American coach John Leonard (not part of the US Olympic team) that it was “impossible” without some kind of doping to help her. “Same kind of things happened in basketball. It’s a simple question. Is the match-fixing scandal right? Does a gold medal value more than anything else?”. Click here for the entire article regarding Yao’s comments. Now that the Chinese have been eliminated from basketball competition, Yao will not continue commenting on any of the remaining basketball games. Raymond reports that Yao will probably go to Africa this week for some United Nations environmental and wildlife protection campaigns and activities. 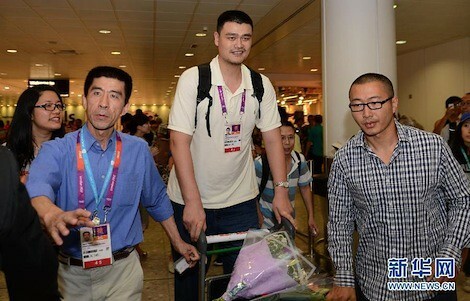 Yao Ming arrived in London a couple of days ago for the 2012 Olympics. He will be a basketball announcer for CCTV5. Click here for more photos of Yao arriving at the airport in England. You can bet we will have more photos of Yao in London as the Games start and progress, so make sure to come back! You are currently browsing the archives for the 2012 London Olympics category.